Kusmag 60 caps -Overcoming indigestion. Shed fart, increase appetite, and relieve pain. •Turmeric is used for appetite enhancer. •Liquorice beneficial to help maintain digestive health. •Cilantro is usually used to facilitate digestion and appetite enhancer. 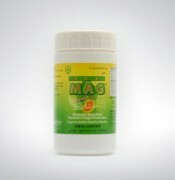 Helps relieve nausea, heartburn, flatulence. Take regularly 2 times a day @ 2 capsules. The dose may be increased or decreased as needed.